Star Trek: Asterisk "The Devil in the Dark"
After a series of attacks down in a mine, the Enterprise is called in to solve the mystery of why they're happening and from what. Answering a distress call, the Enterprise goes to Janus VI and talks to the mining chief engineer there, Vanderburg. He explains that the miners at Janus VI were mining pergium, they opened up a new section of the mine and suddenly they were attacked by some kind of monster that burns them to bits. And for some reason he doesn't think it has anything to do with the unnaturally round orbs that they found down there and keep as souvenirs. So while they're yammering on, one of the creatures attacks the guard outside of the nuclear reactor and damaged it, stealing a circulating pump, so that after a while it'll blow and irradiate the whole mine. They rush to try and fix it, but Scotty says it'll take 48 hours to whip together spare parts to Macgyver a new pump. Because Scotty is good enough to do that. And that's why he's the engineer. 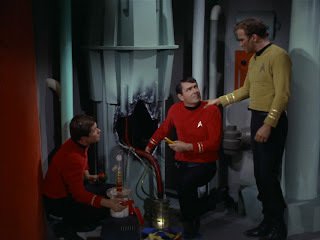 In the meantime, Scotty surmises they might be dealing with a silicone-based lifeform. 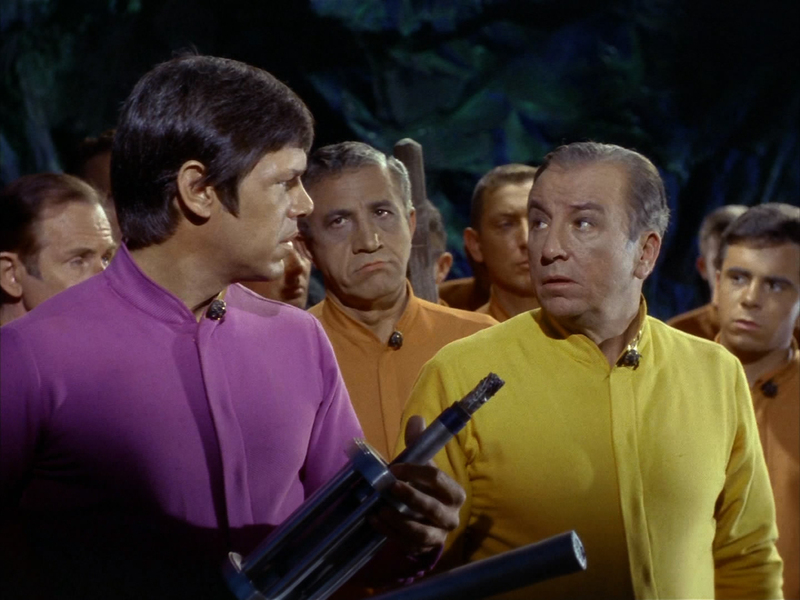 Kirk gathers together a group of redshirts for a hunting trip. And, as if on cue, one of the redshirts is attacked and killed by the creature. Answering the blood-curdling scream, Kirk and Spock go find the creature, shoot it with a phaser and damage it, but it runs away. It burrows a hole in the rock. A perfect circle of a hole. He moves through the rock like a human moves through air. They split up for a while and Kirk finds a whole cavern the spheres. Spock warns him not to damage them, but still won't tell them that they're eggs his theory about them. Finally, Kirk confronts the creature face to face. It's obviously the same creature because a part of it is damaged. He doesn't shoot to kill it, though. He moves around and the creature seems to follow him... he thinks it may be intelligent. Spock finally comes along and urges Kirk to shoot it, but Kirk stands his ground, convinced that it's intelligent. So Spock does the logical thing when approaching an intelligent lifeform that can't talk: he initiates a mind meld. Through Spocks voice, the creature calls itself a Horta and says all these random mumblings about being in pain and the Chamber of Ages and yadda yadda yadda - whatever. The point is, she needs a doctor, So Kirk calls down Bones. Bones comes down and says "I'm a doctor, not a brick layer! ", but goes on trying to fix the Horta anyway. Meanwhile, as Spock continues the mind meld, Kirk goes into the "Chamber of Ages" and sees all the orbs. And that's when they finally realize what I knew all along: they're eggs. And when they opened up the new section of the mine, they destroyed all the eggs and the mother was just trying to protect her young. In the chamber, Kirk finds the circulating pump that the Horta stole and brings it back, fixing the reactor. You know where to put that thing. 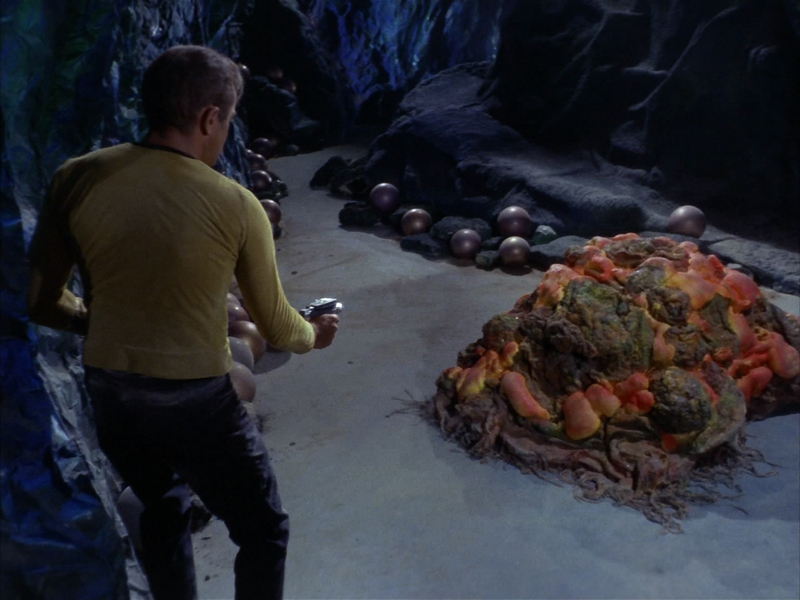 In the end, they come up with the brilliant idea to hire the Horta to dig holes for the mine. She would work at minimum wage at first, but would be given health benefits with plenty of opportunities for advancement and a daycare center for the young'uns. Speaking of health benefits, Bones chimes in and says he's beginning to think he can work miracles because he just bandaged up a lifeform that's completely foreign to his medical knowledge. Hooray for Bones! And they all live happily ever after and learn an important lesson about child rearing. This is one of the rare instances where the alien they're facing is in no way, shape or form humanoid. No legs, no arms, no head - just a lump of rock. It makes sense, really. But it happens much more rarely than one might expect from a series that explores the galaxy. In that sense, this is a very original episode. And for that, we thank it. A fine job all around.